Jump in the cockpit of the most authentic WWII fighter simulator ever created for the PC! Fly one of 13 classic World War II dogfighters in pulse-pounding battles. With ultra-accurate full-force flight modeling, you'll know exactly how it feels to pilot a real WWII warbird. Even rookies can leap right into the fray with the Quick Flight mode. 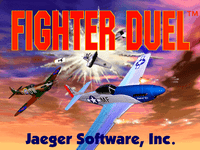 Face up to eight computer enemies in seven realistic tactical scenarios or fly against a human opponent via modem. Experience the ultimate in PC graphics as you scan the skies with multiple cockpit views, camera angles covering 360 degrees and a photorealistic, fully-functional instrument panel. Get ready for non-stop, high-flying warfare! Planes include the P-51D Mustang, ME-109E, G and K, FW-190 and 4 British Spitfires.